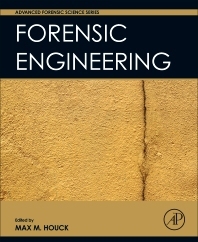 Forensic Engineering, the latest edition in the Advanced Forensic Science series that grew out of recommendations from the 2009 NAS Report: Strengthening Forensic Science: A Path Forward, serves as a graduate level text for those studying and teaching digital forensic engineering, as well as an excellent reference for a forensic scientist’s library or for their use in casework. Coverage includes investigations, transportation investigations, fire investigations, other methods and professional issues. Edited by a world-renowned leading forensic expert, this series is a long overdue solution for the forensic science community. Initial Evaluation: Can This Inspection Be Conducted Safely? Dr. Max M. Houck is an internationally-recognized forensic expert with research interests in forensic science, education, and the forensic enterprise and its industries. He has worked in all aspects of forensic science, including at the FBI Laboratory. Dr. Houck has published widely in books and peer-reviewed journals. His anthropology and trace evidence casework includes the Branch Davidian Investigation, the September 11 attacks on the Pentagon, the D.B. Cooper case, the US Embassy bombings in Africa, and the West Memphis Three case, among hundreds of others. He served for six years as the Chair of the Forensic Science Educational Program Accreditation Commission (FEPAC). Dr. Houck is a Fellow of the Royal Society of Chemistry and a founding Co-Editor of the journal Forensic Science Policy and Management.